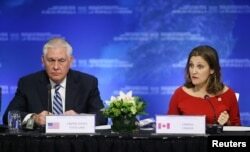 U.S. Secretary of State Rex Tillerson and Canada’s Foreign Minister Chrystia Freeland speak at a news conference during the Foreign Ministers’ Meeting on Security and Stability on the Korean Peninsula in Vancouver, British Columbia, Jan. 16, 2018. Passengers on a commercial flight from San Francisco to Hong Kong could see a North Korean intercontinental ballistic missile flying through the November sky, U.S. Secretary of State Rex Tillerson told a gathering of foreign ministers in Vancouver, Canada, Tuesday, highlighting what he called the "recklessness" of Kim Jong Un's regime. North Korea test fired what it said was an ICBM on November 28. According to the Federal Aviation Administration, the commercial airline was 280 nautical miles from the point of impact. At the time, it said, there were nine other flights within that range. ​"Over the course of that day, according to the Department of Defense, an estimated 716 flights were due to pass within that range. The FAA says the total available seats on those 716 flights were 152,110. That’s a lot of people from a lot of countries being put at risk by an irresponsible testing of ballistic missiles," said Tillerson, emphasizing that the potential for a North Korean missile or parts of it to affect civilian aircraft is real. Tillerson didn’t say which airline the passengers were on when they saw “parts of a North Korean ICBM test flying through the sky," or whether the plane changed its route as a result. U.S. Secretary of State Rex Tillerson speaks with Canada’s Minister of Foreign Affairs Chrystia Freeland during the Foreign Ministers’ Meeting on Security and Stability on the Korean Peninsula in Vancouver, British Columbia, Canada, Jan. 16, 2018. "Based on its past recklessness," Tillerson said, "we cannot expect North Korea to have any regard for what might get in the way of one of its missiles, or parts of a missile breaking apart." Tillerson' sobering recollection punctuated a meeting of top diplomats from 20 countries seeking to form a united front to what is widely perceived as Pyongyang's nuclear aggression. The secretary of state noted the world is at a "tenuous stage," considering how much North Korea's nuclear efforts have advanced recently. Tillerson said the United States and other nations are "resolute" that North Korea will never become a nuclear power. Co-hosted by Canada for the United States’ Korean War allies, the Vancouver meeting is seeking ways to avert the threat of conflict with a nuclear-armed North Korea. The participating countries sent troops or humanitarian aid under a U.N. effort to repel the North during the Korean War from 1950 to 1953. China and Russia - accused by Washington and others of not doing enough to stop the North from pursuing its nuclear ambitions - were not invited. In a joint statement, the nations agree to consider and take steps to impose unilateral sanctions and further diplomatic actions that go beyond those required by U.N. Security Council resolutions. Washington also called on nations to take actions to strengthen global maritime interdiction operations to foil North Korea’s illicit activities. "Today we discussed ways to further increase pressure on North Korea through more effective sanctions implementation and compliance. And countries came forward with proposals on how they intend to do that. We agreed that the need for U.N. member states, especially China and Russia, to fully Implement agreed-upon sanctions is essential to their success. We discussed the importance of working together to counter sanctions evasion and smuggling," said Tillerson at a joint news conference with Canadian Foreign Minister Chrystia Freeland. 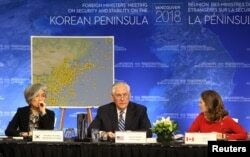 South Korean Minister of Foreign Affairs Kang Kyung-wha, U.S. Secretary of State Rex Tillerson and Canada’s Minister of Foreign Affairs Chrystia Freeland attend the Foreign Ministers’ Meeting on Security and Stability in Vancouver. ​The top Canadian diplomat cautioned the world not to be fooled by North Korea. "We welcome last week's agreement between North and South Korea to hold military-to-military discussions and for North Korea to participate in the Winter Olympics next month. These are encouraging signals. But let me be clear, no true progress can be made in addressing instability in the Korean peninsula until North Korea commits to changing course, and verifiably and irreversibly abandoning all of its weapons of mass destruction," said Freeland. Tuesday's ministerial talks come just days after a mistaken missile alert sparked panic in Hawaii. "Additionally, we must increase the costs of the regime's behavior to the point that North Korea must come to the table for credible negotiations," Tillerson said during the opening of the talks. North Korea has defied U.N. calls to refrain from nuclear and ballistic missile tests. The November test of an intercontinental ballistic missile spiked tensions and sparked a war of words between U.S. President Donald Trump and Kim Jong Un. Those tensions have eased somewhat in recent weeks, and representatives from North Korea and South Korea held their first formal talks in two years. But experts warned Pyongyang could be buying time to perfect its nuclear capability, while trying to get some sanction relief. "Actually next year, actually in 2018, it’s predicted that North Korea’s economy will be only one of a few economies that’ll actually regress. And that’s a huge sign and a real challenge with the sanctions that have been placed. And the reason that the North Koreans are all going through all this, is because they want nuclear weapons to hit the United States," director of defense studies at the Center for the National Interest Harry Kazianis told VOA.